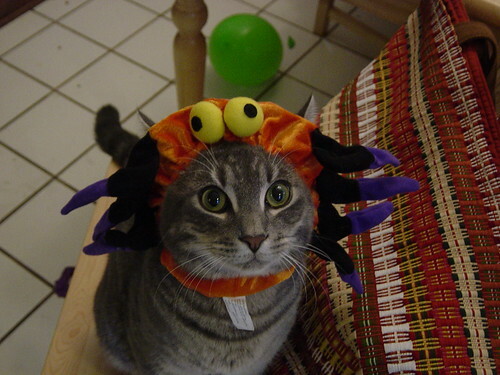 This picture has appeared here before, but Doozer’s expression is classic “I’m going to bite your face” so I couldn’t resist posting it again for this Halloween edition of Whiskers On Wednesday! Now, go humiliate dress up your pet! Heheh fantastic!! Doozer is like “why do you torture me when I show you nothing but love”! LOL! I’m still trying to figure out what I can do to one of mine. LOL…Oh, now THAT’s hilarious!! I’m afraid I won’t have a face come Friday night! Doozer looks a lot like my Lilliane! I’m not going to try costumes on either cat: Lilli wouldn’t take well to it, and Evangeline has to spend Halloween in the basement (so Lilli will accompany her). I’ve always had black cats, Evangeline literally NEVER goes outside – but black cats have a long history of UNDESERVED bad press this time of year and mine is going to be tucked in an safe, as she is every year. So a costume would be unappreciated anyway.